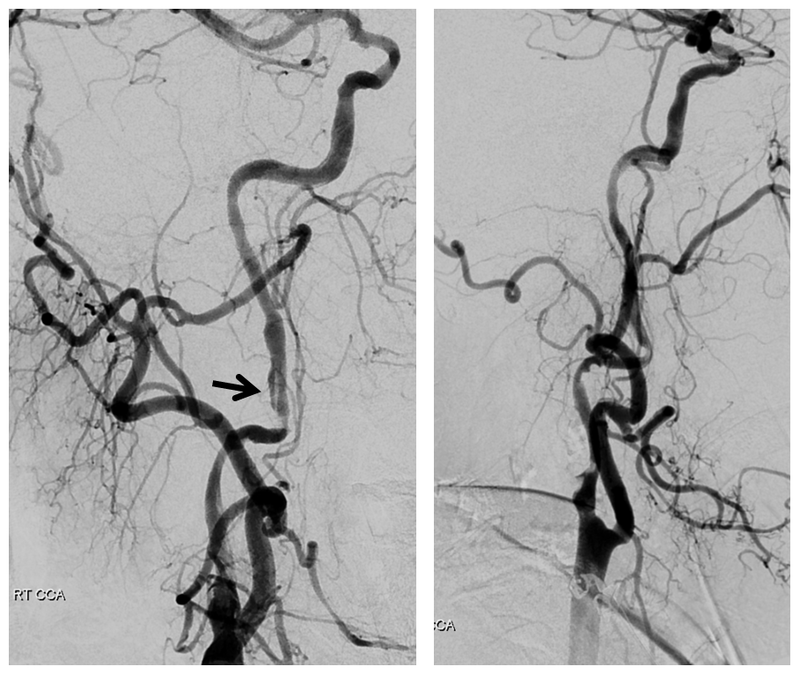 Collaterals play a key role in determining the rate of cell death and thus, window for intervention, in acute ischemic stroke. 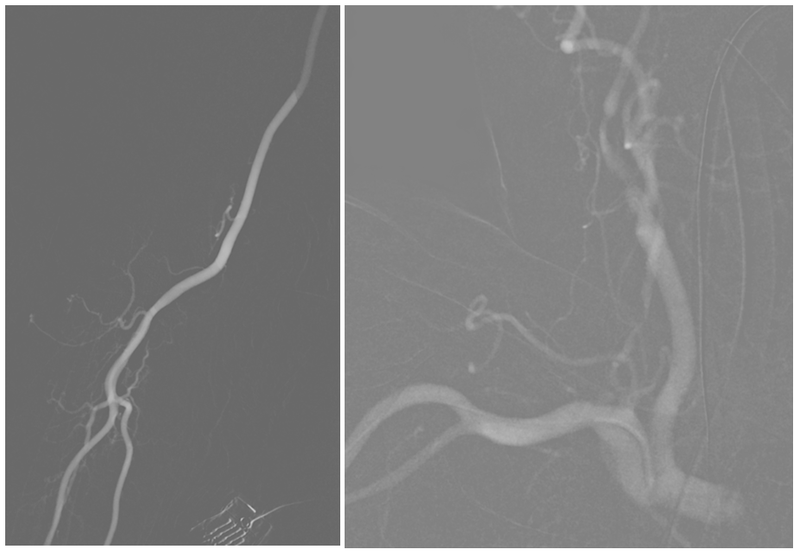 In fact, without collaterals of some sort its usually all over in about 15 minutes — too fast for any kind of intervention unless the stroke is iatrogenic. We have all seen PCOMs, ACOMs, leptomeningeals, ophthalmics, etc. 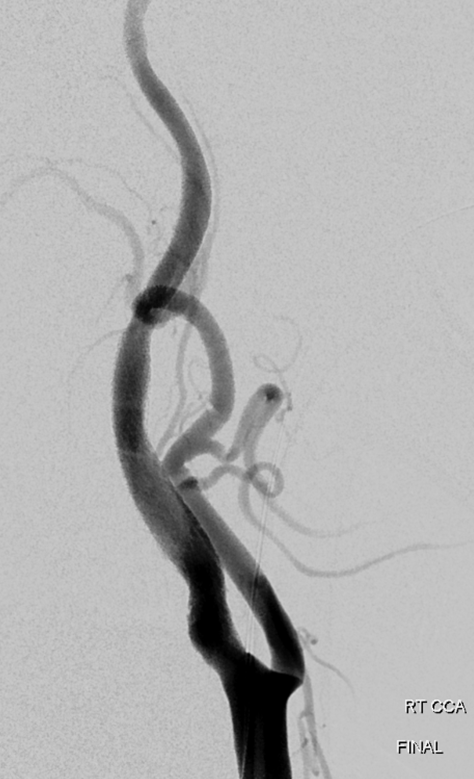 What is Persistent Stapedial Artery. If you are a neurointerventional attending, you should know. if you are a fellow of more than a few months length, you should also know. 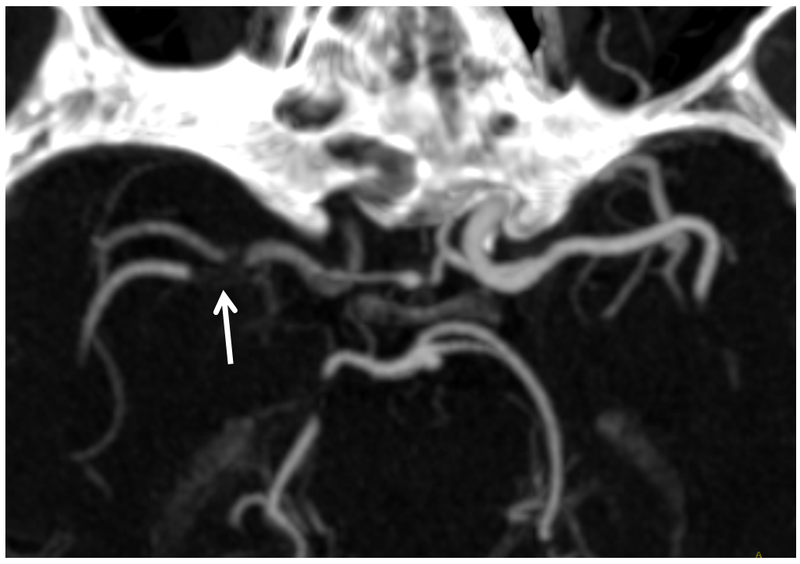 For those who don’t, it is a persistent embyronic origin of the middle meningeal artery, which in the early embryo originates from the (future) petrous segment of the ICA via the hyoid / stapedial artery connection. 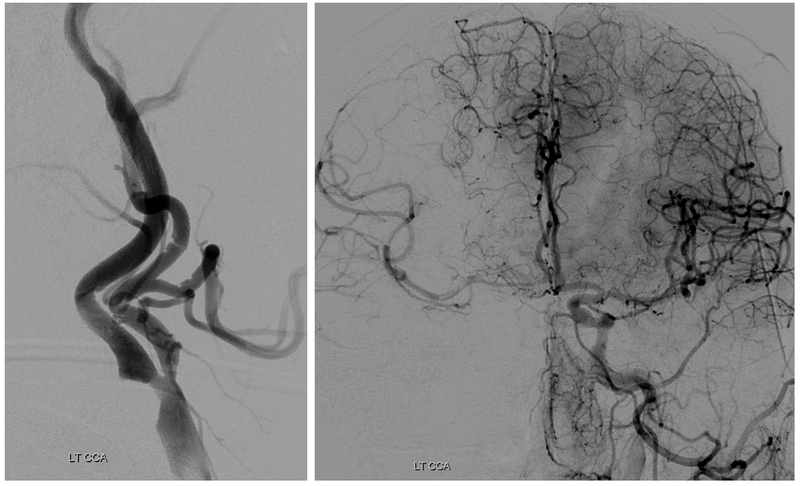 Later on the MMA is transferred to the external carotid system, except in the very rare instance when it does not. 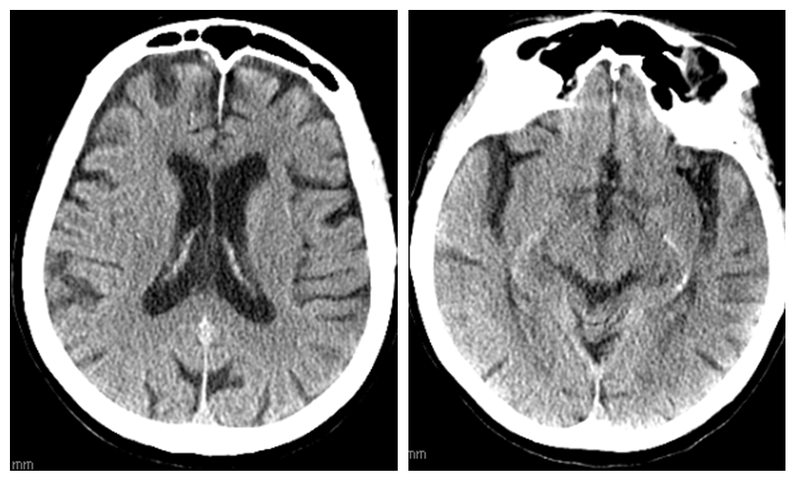 In this case, the MMA comes from the petrous segment of the ICA — the stapedial variant. See AJNR source here, or persistent stapedial page of this website. 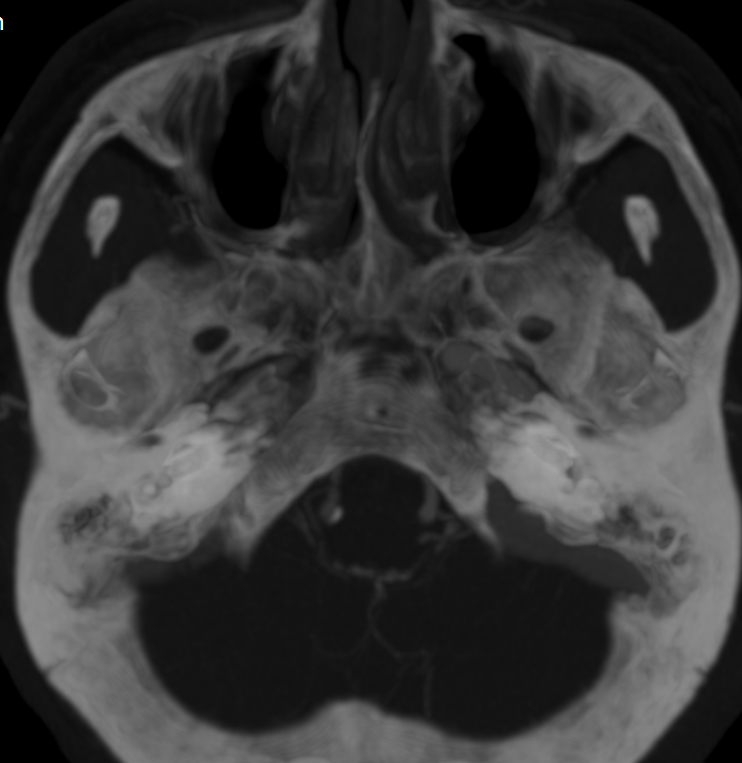 Minimal flow (vasa vasorum actually) in the cervical ICA (white). However, there seems to be decent amount of flow in the petrous segment (black). Strange, right? This tells you that there is something reconstituting the petrous segment, but what? 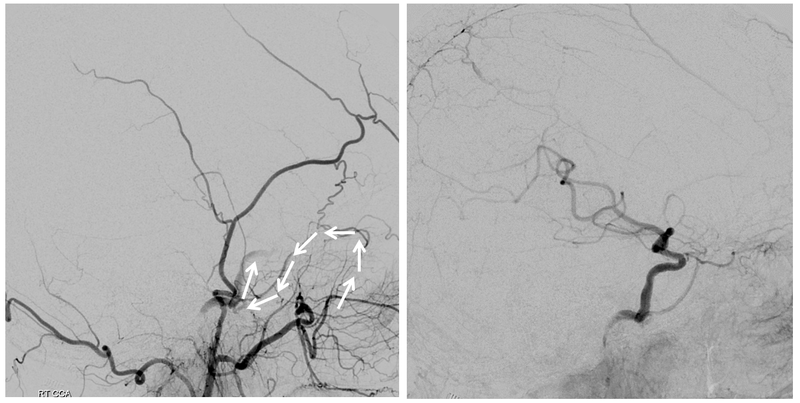 For the students of anatomy, what are the options for petrous segment reconstitution? Mandibulovidian , carotidotympanic, lacerum branch of the ascending pharyngeal, right? 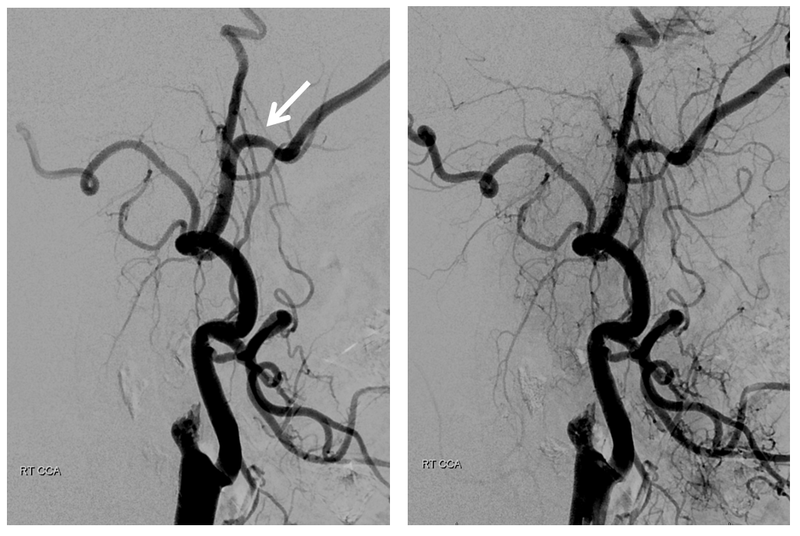 Mandibulovidian is less likely as comes off the distal petrous segment and here there is contrast in the proximal portion. 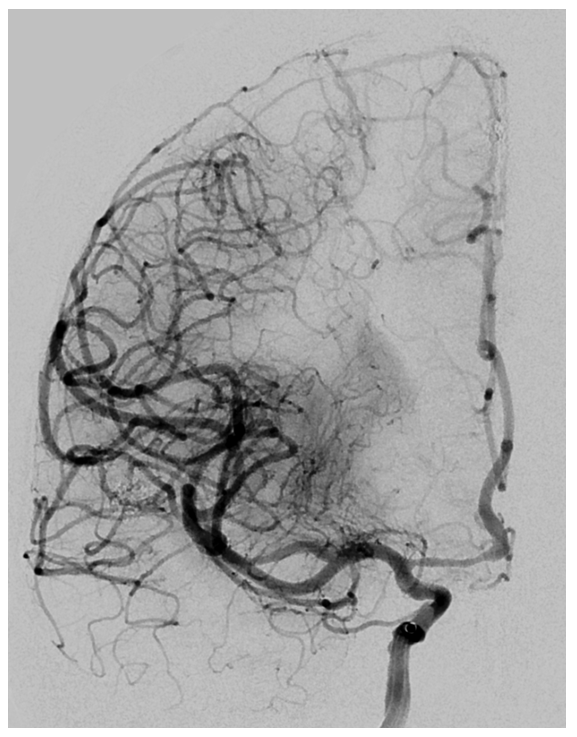 This leaves inferior tympanic or carotid/lacerum branches from ascending pharyngeal, and middle meningeal stapedial variant via the carotidotympanic. 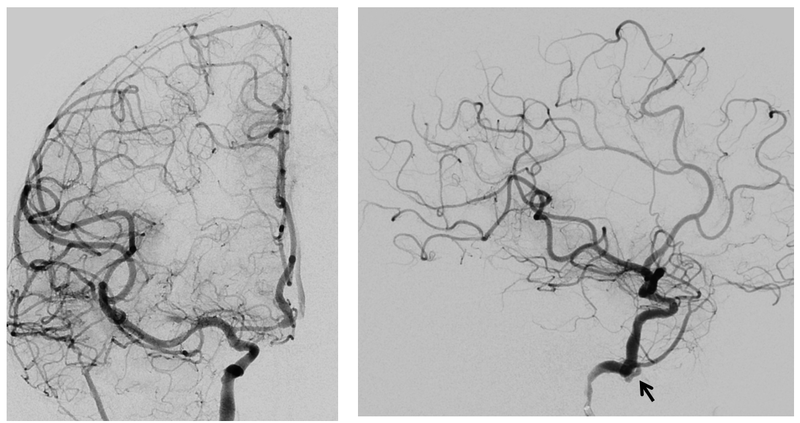 Final possibility is vasa vasorum reconstitution but given tandem occlusion this is unlikely. Again, knowing anatomy tells you where to look for answers. Left side. Working hard under suboptimal circumstances. 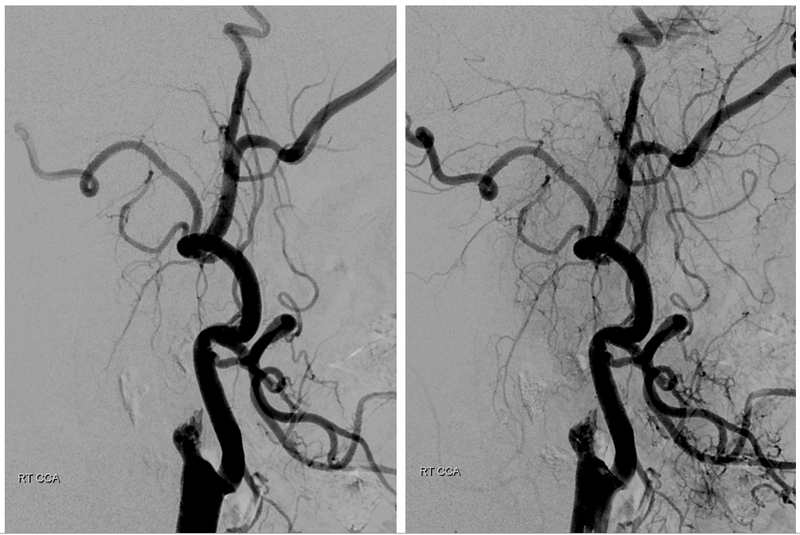 There is decent ACOM cross-filling however the superior division seems out and there is additional inflow coming from the right carotid. Right CCA. ICA is occluded. What is curious about the ECA? Right CCA views over the head. As expected there is ICA reconstitution (white arrow) with a shadow of MMA (black arrow). What happens? The middle deep temporal branch of the IMAX retrogradely supplies the persistent stapedial variant of the MMA which again retrogradely reconstitutes the ICA. It is a very significant amount of additional flow. 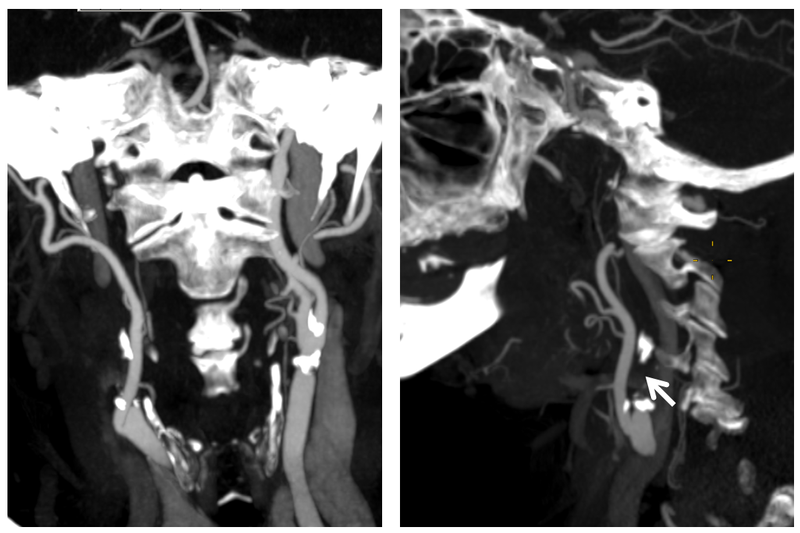 Final post views show patent cervical ICA with proximal atheromatous stenosis and mid-cervical segment non-occlusive dissection (black arrow) — probably iatrogenic during re-opening of the carotid. 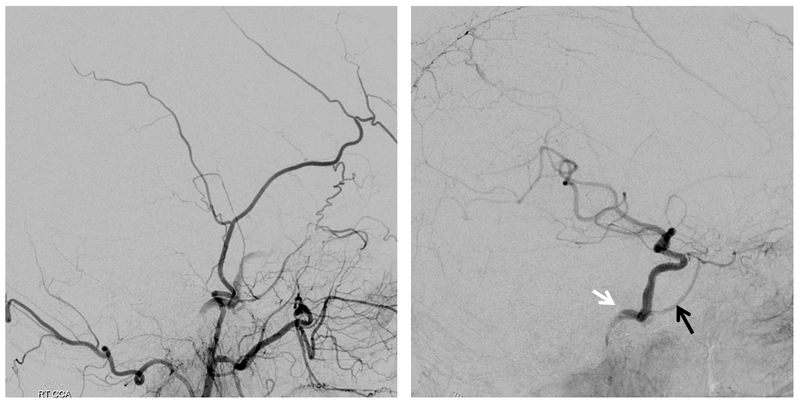 It is a not so infrequent occurrence when reopening cervical occlusions and is usually well-tolerated. 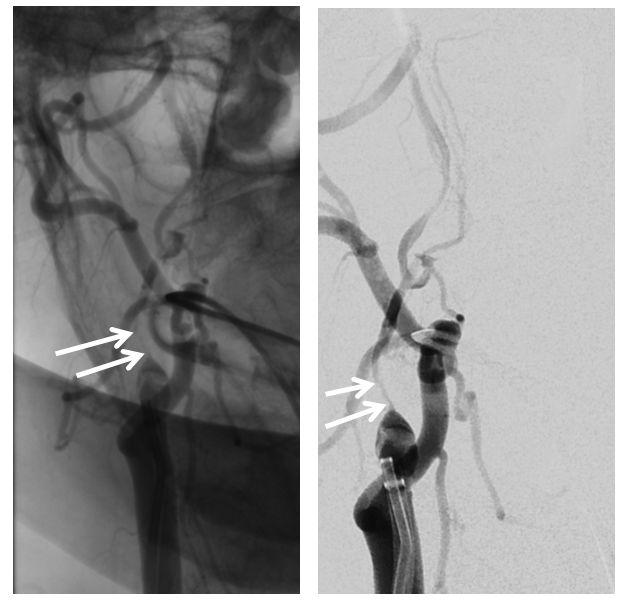 A Precise for the ICA bifurcation and a Pipeline for the dissection. We prefer Pipe in upper cervical carotid due to its superior conformability and flexibility. Leaving dissected segment alone is certainly an option if stable. Conclusion: Knowledge of anatomy allows for some interesting pickups and maximizes understanding of all kinds of cases.